I refer to chips, pop and chocolate bars as the holy trinity of junk food. I made up this term to help people become more aware that these three ‘foods’ feed upon each other and can cause overeating. Chips can be addictive on their own with their salty crunch in small pieces you eat by the handful. Take a sip of sweet tasting pop with a touch of acidity in between and your taste buds reset for more salt, which is satisfied by more chips. Then, you want a little sweetness, so you reach for a chocolate bar. A person could easily cycle through the chips, pop and chocolate bar several times and barely register feeling full, as you are moving from one taste sensation to another. These are foods we like to eat for the taste and texture sensation they provide. The salty crunch of the chips, the effervescence of the pop and the creamy, sweetness of the chocolate bar. Perhaps you do or do not eat the holy trinity of junk food together. I will confess here that I love potato chips, a bubbly drink and chocolate, but I don’t tend to eat all three of them in the holy trinity format at once. I prefer to enjoy each of these foods separately. Sometimes, I have flavoured club soda with chips. My recommendation is to have high quality, real food that satisfies all the taste and texture sensations mentioned above. For Chips: Try ‘fresh’ chips (which have a short shelf life) such as the handcut potato chips at Leah’s 621 St Clair Avenue West www.leahs.ca or the brown bag potato chips at the Whole Foods www.wholefoodsmarket.com sandwich counter. Any freshly made chip you can get your hands on is a good choice. For Pop: Try sparkling water with added flavour. A squeeze of lemon, lime or orange works well in bubbly water. For an extra burst of flavour try Minisyrup http://www.zavida.com/minisyrup, an unsweetened, natural flavouring product on its own or in addition to the squeeze of lemon, lime or orange for a healthy calorie free soda or pop. Natural minisyrup flavours are: grape, lemon, mango, pear, orange, raspberry, strawberry kiwi. Many testers have really enjoyed a mango lime soda just for the taste. ‘It’s like pop!’ has been the response and they have been pleasantly surprised that it was calorie free with no (artificial) sweetener. They are a delicious lower sugar soda. Their cordials mixed with bubbly water would also be a great pop alternative. For chocolate: Try dark chocolate, which has less sugar. Stick with milk chocolate if that is what you prefer. I love Gallerie au Chocolat www.galerieauchocolat.ca, which is available at Whole Foods. Green and Blacks, Cocoa Camino are also great organic chocolate bars with interesting flavours. Lindt has a good variety of dark chocolate and is widely available. You may find that you will be naturally inclined to eat less chips and chocolate if you have a less processed real food version. The lower sugar pop alternatives are also helpful in guiding your appetite. Please thoroughly enjoy your holy trinity of junk food in moderation, free of guilt. The author also wrote the Blue Zones, which is a great book that details various pockets in the world where people have great longevity by living a more traditional lifestyle. Generally, it seems to me that taking time to enjoy the present moment of your life is a way to be well. I most certainly love to make life good. I am 8 years late in my discovery of Mela Cafe, Italian Vegetarian Magic at 7 Yorkville Avenue 416 916 0619. Perhaps its location where Wanda’s Pie in the Sky once was kept me from coming too close, as I missed Wanda’s very much. I came across Mela Cafe last week after buying DLish cupcakes and looked around the corner for some lunch. Yes, I got dessert before choosing a spot for lunch. The chalkboard menu and glass display cases at Mela Cafe were very enticing. I tasted a certain magic in the food with the mixed veggie salad and sweet potato mash with rapini topped with homemade tomato sauce I had. I enjoyed my lunch so much that I went back the next day for beet risotto with greens, which was delicious. As was their signature eggplant sandwich, which I enjoyed another time. Mela Cafe is a great little spot to have some lunch or get takeout for dinner. Their food is prepared with great care to a point where the chefs Roberto and Kim grow their own vegetables. They are real innovators here. The quality shows through in the delightful taste of the food. I highly recommend Mela Cafe for a healthy, delicious meal that inspires us to eat more veggies by showing us how tasty veggies can be. What an amazing accomplishment for Mela Cafe! I discovered DLish cupcakes shortly after the shop opened on Queen Street West. I became particularly enamoured with their red velvet cupcake. I quite enjoyed the rotating flavours with the days of the week (it keeps you going back!) and I did eventually try most of the flavours. I was in New York and San Francisco in the fall of 2011 and tried some other red velvet cupcakes. I must say the DLish red velvet cupcake with its perfect size, moistness and proportion of great icing to delicious cake, stands out as my favourite even in comparison to the red velvet cupcake at Magnolia in New York. It was with great delight that I bought and enjoyed some cupcakes with friends last week from the second location of DLish at Yonge and Yorkville. Red velvet, salted caramel and apple caramel were my picks. Apple caramel being a great new flavour! It was great to see the same store concept and quality of cupcakes replicated with such consistency. My answer is a resounding yes. I love food and I love to enjoy good food. I was encouraging people to try DLish cupcakes this weekend (yes, I bought people cupcakes). They are delicious and made with great care. A huge component of good nutrition, health and well being is enjoying life, which includes truly enjoying what you want to eat. Enjoying a cupcake is most certainly a part of Making Life Good! We had a special occasion to celebrate last night and our group of four friends had dinner at Foxley 207 Ossington Avenue, Toronto. Somehow I got carte blanche to do the majority of the ordering…I’m pleased to report all four of us had a most inspired dining experience with all the amazing and unique flavours Tom Thai creates. Here is what we ordered and shared. I highly recommend trying this list sometime. This is a top Asian fusion dining experience I have had and it won over three friends. Enjoy! Locally grown butternut squash is available at this time of year and the colder weather makes this soup a natural choice. Butternut squash contains beta carotene, vitamin C, manganese, calcium, magnesium and potassium. This is a simple recipe that was told to me verbally by another foodie who highly recommended fried sage as a secret ingredient. The soup is still good even when you cannot get your hands on fresh sage. In a large pot, heat butter or oil over medium heat. Saute onion, apple and pear until softened. Add cubed squash and saute briefly. Add vegetable stock. Bring to a boil. Reduce heat to a simmer for 15-20 minutes or until squash is soft. Let soup cool slightly and puree with an immersion blender until smooth. Season with salt, pepper, cardamom or any other spices to your taste. Enjoy! I just had dinner with a friend at the Momofuku Noodle Bar in Toronto. I did not have patience to wait in line for the noodle bar in New York, but I did have dinner at Momofuku Tsam and a little dessert at the Milk Bar while I was there last year. My friend was recently at the Momofuku in New York and we were both interested to see what it was like in Toronto. It’s a loud, bustling atmosphere with a modern dining room in Toronto. Momofuku noodle bar is very well executed fast food. We really saw that in action while sitting at the bar in front of where the food was being assembled. The shrimp fried rice looked pretty enticing as it was being put together. We did not get to try it, as our server forgot to tell us about the specials, because I distracted him with my questions about the short menu. Service was quite attentive and informed throughout the restaurant, which I really appreciated. Apparently they serve only Tito’s vodka here and in New York and the bartender handled my grumbling with grace. It was a pleasant experience to wait in the upstairs bar area and overlook the busy restaurant below. The brilliance of the noodle bar is in its small menu. David Chang has created a great formula for flavourful asian food and trained the staff well to execute on a focused list of food. The famous pork buns are assembled in volume and are the same as they are in New York. These buns are a great fast food take on Peking duck with its combination of tasty animal fat, sweet sauce, scallion and cucumber in a bun. The ramen comes in a broth that has flavour depth and an egg that is specially slow poached in the combi oven. Special egg poaching technique seems to be a current food trend. We tried a sous vide ‘poached’ duck egg at Peller Estates this summer where the egg texture was the same throughout the white and yolk. The Momofuku brand has a lot of potential to expand further with its fun atmosphere and tasty food that can be replicated. The food here is more exciting than the UK chain Wagamama. However, my favourite asian influenced restaurants remain Mission Chinese in San Francisco for its amazingly spiced food and Foxley in Toronto for its bold and unique flavours. In case you missed it, this was a great Thanksgiving piece on ‘local’ food. People growing and harvesting food in an urban setting. If we all made a little effort and tried to contribute to growing some food in whatever space we have, it would start to make a difference in our community and the environment. The people featured in this article are already setting an example and making a difference. At a time of giving thanks to our bounty, we can consider ways to contribute to the harvest next year. It will take a bit of planning and effort for worthwhile results of producing good food in your own space. The concept of urban farming is not a fad, it is the way of the future. This is a rather loose recipe to inspire you to make a healthy dessert anytime. I consulted with Chef Melissa Saunders to ascertain the appropriate amount of fruit per person. For example, if making apple crisp, allow for about 1-1.5 apples per person you are making crisp for. Or about 1 cup of fruit per person. I tend to leave the fruit plain to let the natural flavour come out through the cooking process. You can always squeeze a little lemon or add a sprinkle of sugar or honey if desired. For the crisp topping. I prefer a simple version with just oats, butter, and brown sugar, because it has more crisp. It is also easy to create a gluten free version by using gluten free oats. Oats on their own are gluten free, it is in processing that they may come into contact with gluten. The formula for the crisp topping would be 1/4 cup oats, 1 tablespoon of butter, 1 tablespoon brown sugar per person. You could use coconut oil instead of butter to make this a vegan recipe. Arrange sliced fruit in an even layer in a glass baking dish. In a medium bowl, mix together oats, butter and brown sugar with your hands until well combined. Spread over prepared fruit in glass baking dish. Bake for 30-45 minutes or until topping is browned as desired. Enjoy warm on its own or with a little whipped cream or icecream. 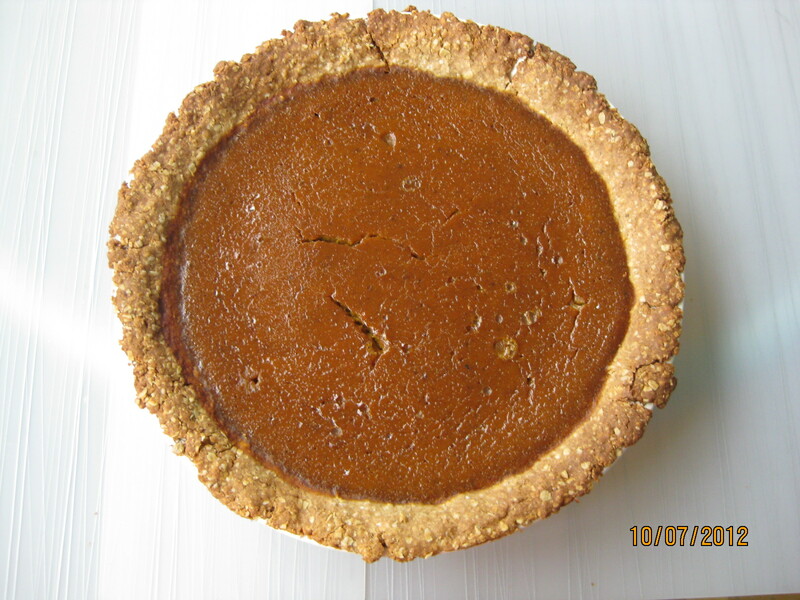 This is my favourite pumpkin pie recipe that I have developed over the years. Chef Michael Smith provided the inspiration for a whole grain crust a several years ago for an apple pie. He even created a gluten free version in 2010. I enjoy the whole grain crust with pumpkin pie filling, because it holds up well in texture and flavour. The filling with apple butter adds a luscious sweet flavour to the pumpkin. I found the original recipe for this filling years ago in my Bon Appetit cookbook. However, the recipe came with a delicious sounding gingersnap crust that included a rim of overlapping pastry leaves, which was sadly beyond my pastry skills. I had to find an alternative crust and this one here a tasty, reasonably healthy choice with the whole grains. In a large bowl, combine flour, oats, brown sugar, cinnamon and salt. Add oil, and mix well until combined. Add water and stir until the mixture comes together. Form a round disc with hands. Chill until ready to use. In a large bowl, whisk together eggs, then add and combine all other filling ingredients. Roll out dough on a floured surface into a large disc enough to cover a 9 inch pie plate. Press into greased pie plate and gently push to cover edges of pie plate. Pour filling into pie plate prepared with whole grain crust. Bake for 45 minutes or until filling is barely set. Remove from oven, cool and enjoy!